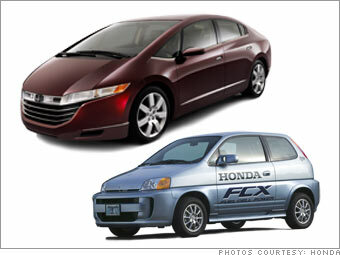 With the new FCX, Honda will take the next step in taking hydrogen powered cars beyond the laboratory. Honda already has two current-generation FCXs on lease to ordinary consumers. (Others are leased to government and corporate fleets.) Both are in California, one with a suburban family, the other with the 17-year-old actress Q'orianka Kilcher. The current FCX, the lower one here, looks boxy and awkward, the automotive equivalent of therapeutic footwear. The new FCX looks like a top-of-the-line Nike, flashy, futuristic, and cool. The new version is also lighter, roomier inside and more powerful.